But they can be so much more. You can use them as a tool to show your personality, generate leads, and entertain your audience. BONUS: Find out when your emails are being read with this invisible tracker. Quick refresher: the recipient of your out of office email wants to hear from you. This gives you an easy opportunity to generate leads, get a laugh, and brighten days. 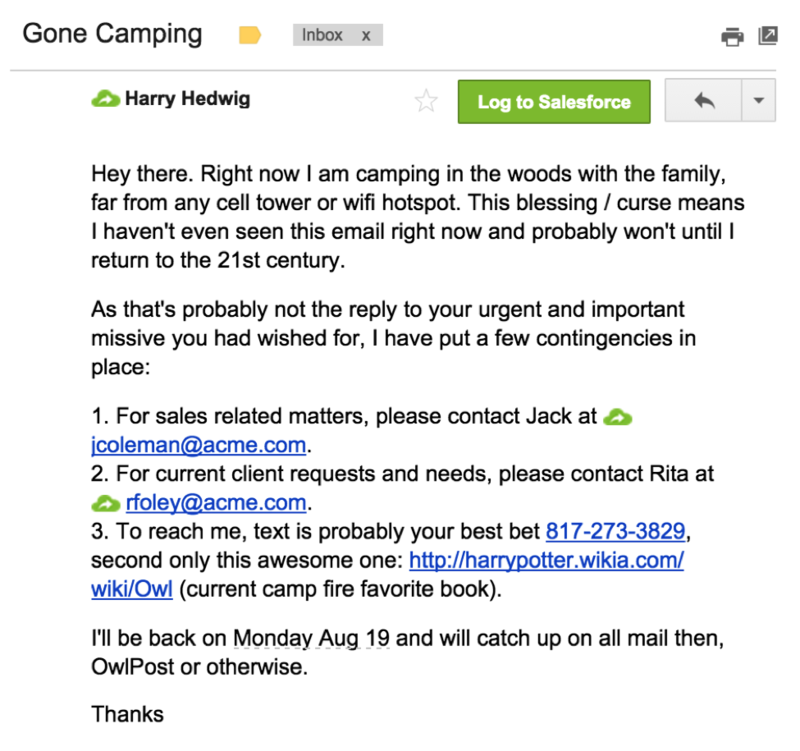 It takes 2 minutes to turn a lackluster out of office message into sales email gold. 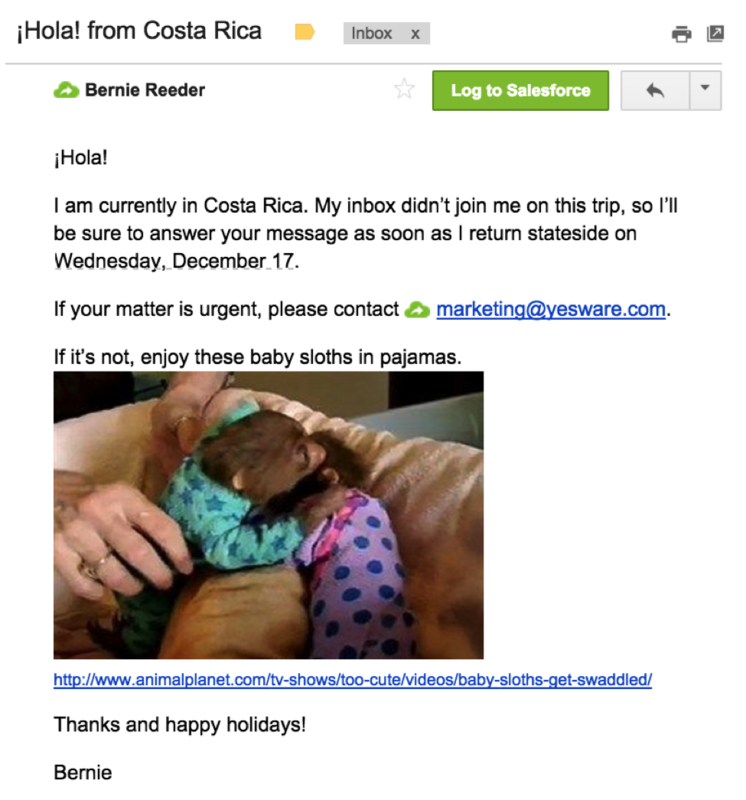 Below are 13 examples of out-of-office replies that keep working for you while you’re away. Over To You: What’s Your Go-To Out Of Office Message? You’ve got a fifty-fifty chance that your out of office message will be read by someone who already knows you, is actively reading email, and wants something from you. Sounds like a great time to share content that helps build trust and drive more sales. 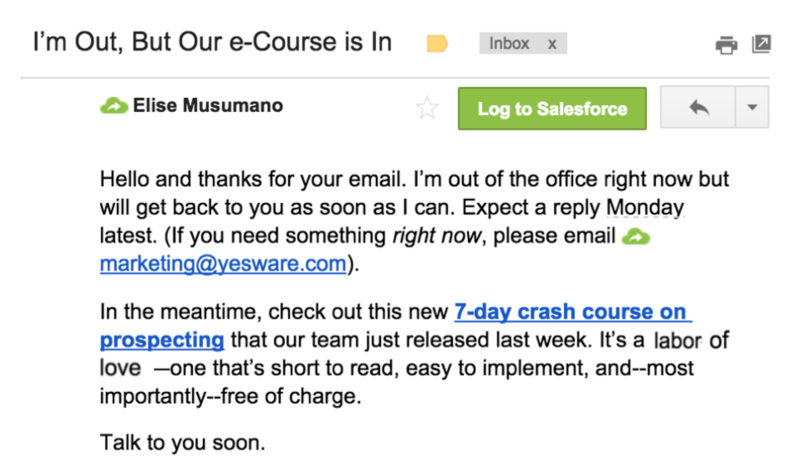 Below is an out of office message example from our own team, linking to our free 7-day course on sales prospecting. Unsure of what resources you should be linking to? Try checking in with your marketing team about new collateral worth highlighting. We love this example from Upserve’s Director of Marketing, Jesse Noyes. He knows his audience, anticipates what people are emailing about, and provides lead-generating content that offers immediate answers to questions. Find out if the emails you’re sending are catching their interest. Our brains love surprises. What’s more, research has shown that small surprises that feel like they were “just for you” can spawn some incredibly strong goodwill from the receiver. Next time you go on vacation, try surprising your customers with an out of office message that breaks the mold. Here are four of our favorite examples for inspiration. If you’re feeling creative, here’s a unique idea for your next out of office message. Everyone can appreciate the excitement of pushing work aside to go on vacation. Shoot, you just missed me. I wrapped up everything at the office and am off on vacation until Monday, 12/26. Here’s a snapshot from my last day in the office. Anyway, if your question or favor can wait, great. 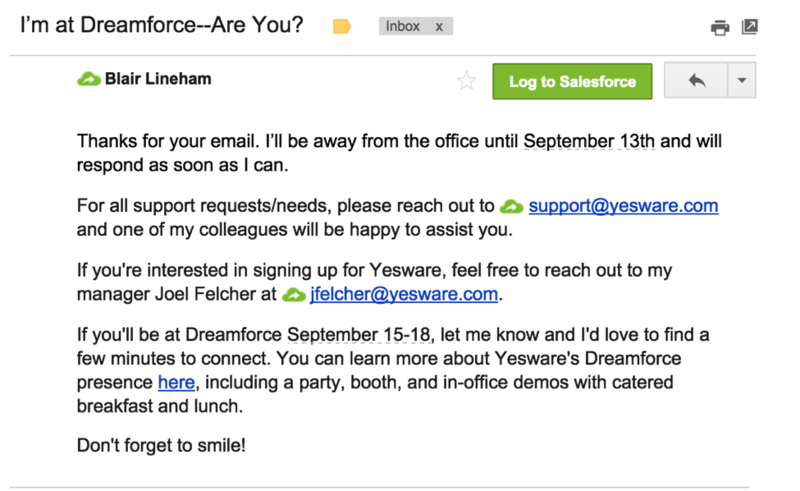 If not, do me a favor and forward your email to marketing@yesware.com and you’ll be well-treated. When to use: If you’re absolutely unavailable but you want deliver some humor with your message. 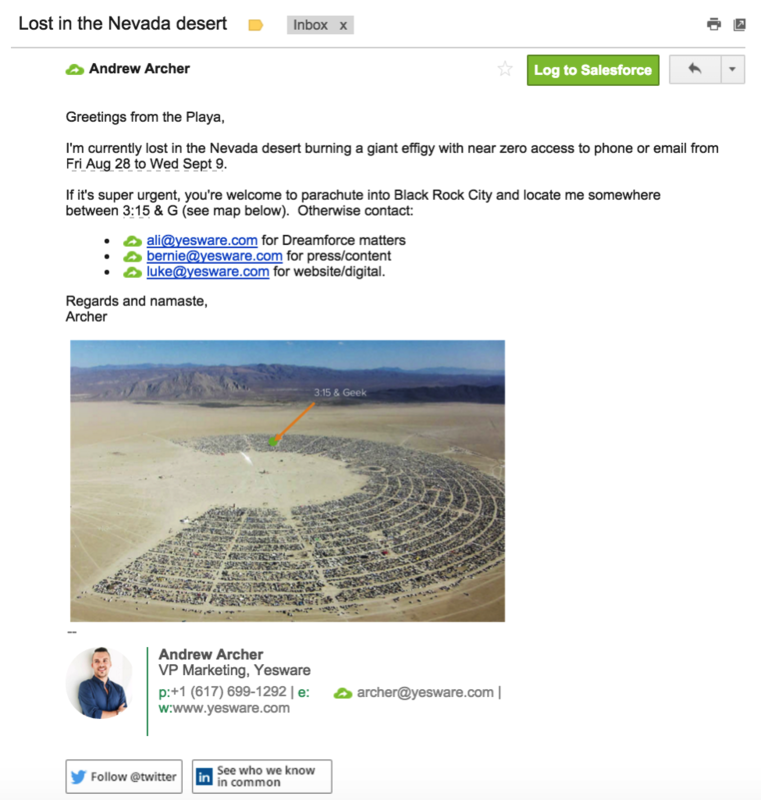 Below is an out of office message example from our former head of marketing, for his time away at Burning Man. Notice the picture that he includes–it’s strategically placed. The picture superiority effect teaches us that including an image with text increases a person’s information recall two days later by 55%. We miss his humor 😂 BTW — Like the sign-off at the end? Give your own email signature the same makeover in seconds. Research out of Hiroshima University found that looking at animal pictures actually increases focus and productivity at work. Including a photo (or two) could help create a positive attitude toward you and increase the likelihood that they remember your email. Here is an out of office message example that our Director of Product Marketing set up before she went on vacation. Is someone covering for you while you’re gone? Acknowledge how awesome they are for helping you out. A few kind words can go a long way — especially if you receive an email from an important customer or prospect while you’re gone. When you compliment your coworker who will receive requests in your absence, it has a two-fold effect. What happens when you start watching a movie or you flip a station on TV that ends up being in a different language? It’s the first thing you notice, right? Emojis are officially a language unto themselves, and they’ll help you catch the attention of whoever has sent you an email. Traveling for work might be a standard part of your job, but it doesn’t mean your email can’t be unique. If you’re traveling to a conference that you expect many of your contacts to be at, too, then use your out of office message as a networking opportunity. Schedule follow up emails so they send when you want them to. Remember the AIDA cold email formula? It also works as an out-of-office reply by captivating your reader’s attention all the way through to the call to action. 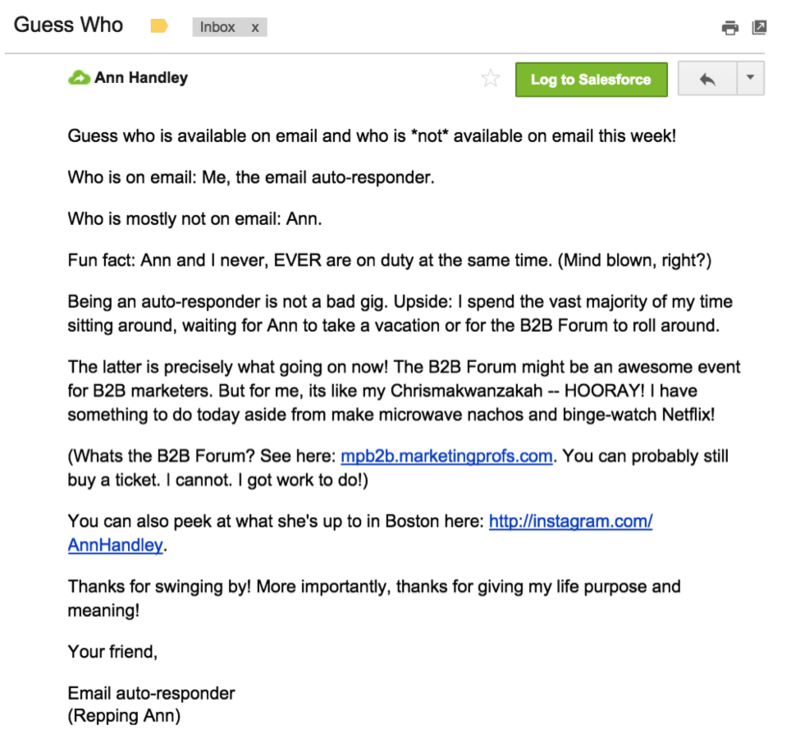 Here’s a great example of how this works from Ann Handley of MarketingProfs. Ann begins with a rhetorical question that grabs her reader’s attention and builds interest with her subsequent details and fun fact. She then creates desire with the way she describes the conference and lists a call to action with the conference website and a link to her Instagram account. Pro tip: To make sure you don’t forget to set an OOO for your next confirmed trip(s), take 5 seconds to schedule a Send Later email to remind yourself. Schedule it for your last day of the office, and we’ll place it at the top of your inbox at the best time for you. With a free trial of Yesware, you can also set a final reminder for one hour before you leave for your next planned vacation or work trip. These final examples are purely for entertainment. While a little humor can go a long way with building rapport with your network, they may not work for everyone. Use your best judgment :). Have some interesting facts up your sleeve? This one’s for you. Remember: Images (especially those in color and with people) will make your email memorable. Our recent post on how to write a damn good email signature focused on this. So did this Danny Tanner aficionado. Ready to write your own, but not wanting to start from scratch? There are 8 examples to copy and paste (then customize) in this OOO template doc. Want to file more than one for the future? Good news: you can stash them right in your Gmail or Outlook inbox. Re-writing the same work emails over and over? Save templates to your inbox. If you’re up for sharing, we’d love to see your own favorites. What can we learn from your experience? Tweet us: @Yesware.